The pressure of the water keeps changing. What's wrong? Can I use any kind of detergent in the pressure washer? Where is the best place to store my pressure washer? Can I use lake water? My pressure washer won't start. What's wrong? Pressure washers (a.k.a. power washers) make home siding, porch or deck washing a simple, do-it-yourself project. In fact, thorough pressure washing of home siding is often mistaken for a fresh coat of paint. The air filter must be clean in order to effectively prevent dirt, dust and other harmful debris from entering the engine. Every four hours of use, clean the filter. Every 100 hours of use or every three months of use, replace it. Pleated, paper air filters cannot be cleaned without damage so they should be replaced. Foam air filters can be cleaned with hot water and a small amount of dish detergent. When the filter is completely dry, saturate it with new engine oil before reinstalling it. NOTE: Do not use oil on a foam filter if your model also uses a paper element filter. Follow your pressure washer owner's manual for specific instructions related to fuel filter cleaning. Note that the location of the fuel filter varies by model so it's important to consult your owner's manual. If there is debris clogging the mesh screen inside of the fuel filter, replace it before using the pressure washer again. Prior to each use, check the oil level of the pressure washer. Fresh oil is golden or amber-colored. As it ages, it will darken. Replace the oil if it becomes too dark – or at least every 50 hours of use or once per season. Periodically check the water inlet screen for dirt and debris buildup. Rinse it with water. Allow it to dry thoroughly before returning it to the pressure washer. If you find any damage to the screen, replace it before using the equipment again. Before each use, check the hose, trigger handle and hose connections for wear or damage. Prior to storing the pressure washer for winter or the off-season, be sure to add fuel stabilizer to fresh fuel. This will slow damaging buildup in the carburetor. To prevent the water pump from freezing in cold regions, create a solution of 50 percent anti-freeze and 50 percent water and run it through the pump. This will keep internal parts lubricated and prevent the pump from cracking. Check all of the hoses to make sure there are no kinks or blockages. Also, check that there's no interruption of the water supply. No, due to the high pressure function of the pressure washer, you should only use detergent designed for pressure washers. 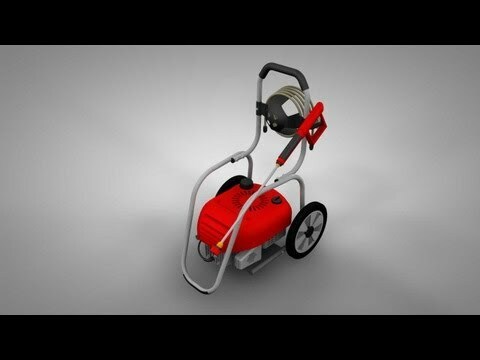 Store your pressure washer in a clean, dry place that is well ventilated. Make sure it is away from open flames or sparks. If possible, store it where temperatures stay above freezing. No, due to risk of debris clogged internal components, you should only use water that's safe enough for your home. With your pressure washer's model number ready, head to our Repair Help information for troubleshooting help.